Since the publication of The Remarkable Trees of St Albans, people have contacted Kate to tell of other trees and other stories associated with trees. If you have a story to add please email treeblog@walk-talk.co.uk to share it. Gary Wilde of Wilde About Hair in French Row, St Albans, told me that when he was a lad living in Marshalswick, he and his mates used to muck about round an old oak tree close to the old farmhouse at Jersey Farm. They called the tree 'the hollow oak'. It was also close to Jersey Lane so it was easy to get to. The lads could climb up into its canopy from inside the hollow trunk of the tree. Do you remember the 'hollow oak'? Do you have photos of it? Did you do a sketch of it? Could you do a sketch now? If so, please share by emailing treeblog@walk-talk.co.uk or use any of the contact details at contact us. 'Forgive me if you know this already. One of the Friends of Bernards Heath researched the name “Beech Bottom”. 'He discovered that is not a recent name commemorating the Victorian planting of beech trees there. Instead it is a variant of “Batch” as in Batchwood Hall, and thus medieval or earlier. It was Peter who told us of what he referred to as 'perhaps the only famous tree in St Albans', despite the fact that it no longer exists. It is the oak tree, probably near the King Will, under which Henry VI sat obliviously singing hymns to himself while the Second Battle of St Albans raged around him on 17 February 1461. As Peter says, 'It does conjure up quite an image'! It was only in May 2010 that I made contact with Donato Cinicolo and he offered to contribute his wonderful photography to the book. This meant that there are several trees that were no longer in flower. 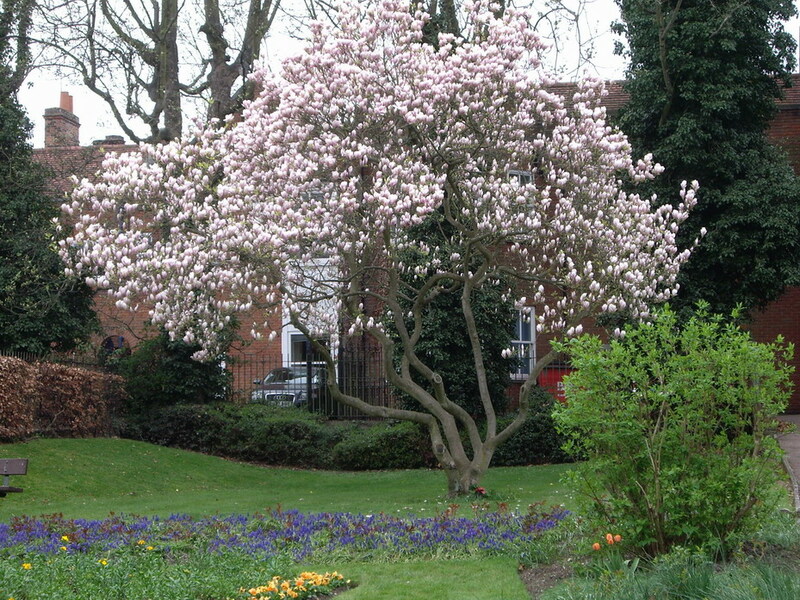 One of those trees is the magnolia tree in the gardens behind St Peters Street between the Civic Centre and Hatfield Road. It is spectacular in early spring. Here is my own photograph of the tree in April 2011. I met Carol Parker on a guided walk 'Made in Fleetville' organised by Fleetville Diaries. Carol told me that for the Beaumont Avenue Queens jubilee street party they had found some early photographs of their road and directed me to where they had been found on the Internet. I contacted the photographs' owner, Andy Lawrence. 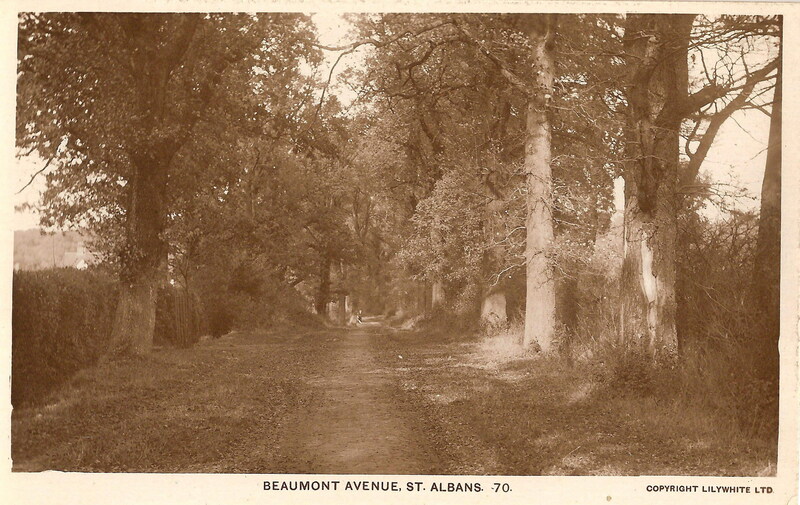 He has made available to us all some remarkable photographs of St Albans. The images can be seen at the wellsandlawrence's photostream on flickr and you can find out more about how Andy came to have the photographs at St Albans People.. Do take time to follow some of the amazing stuff Andy has captured. There are snippets of 'The Avengers' and 'The Saint' showing Steed or Roger Moore in our streets as they were in the 1970's. Andy Lawrence was pleased to let me share his photographs showing trees. Ian Tonkin read of Penny Jones' regret at the loss of "a large tree in the middle of where Hatfield Road, Clarence Road and Camp Road meet, forming a roundabout. I can't remember what kind of tree it was, but it made a huge and wonderful impact on the area. There must be pictures of it somewhere." There is a picture of it. 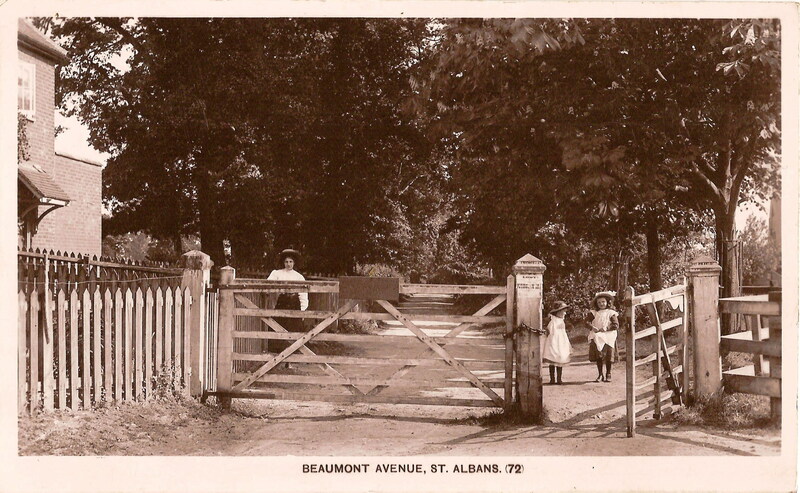 Ian sent in a post card photograph which Ian thinks was taken about 1914-15. It shows a spreading tree with a soldier standing in front of it under a sign post, railings round the tree, shrubs within the railings under the tree. I cannot tell the species of the tree from the photograph. Do you know? Please email treeblog@walk-talk.co.uk to share what you know of the tree that used to be outside The Crown pub. Of course, there is more to see in the photograph than the tree. I wonder why the soldier is standing there. He looked as if he has been positioned, rather than casually waiting for someone. I wonder what was in the cart. Is it too tall for a milk churn? And what is in the box to the soldier's left, alongside the railings. It looks as if it has a St Albans crest on it. Penny Jones wrote on receipt of a copy of the postcard, "I’m truly thrilled to see the tree. "Also, I’m intrigued by the building to the left of the picture, next to the pub. My great uncle was a coal merchant in St Albans years ago and had a little office there. 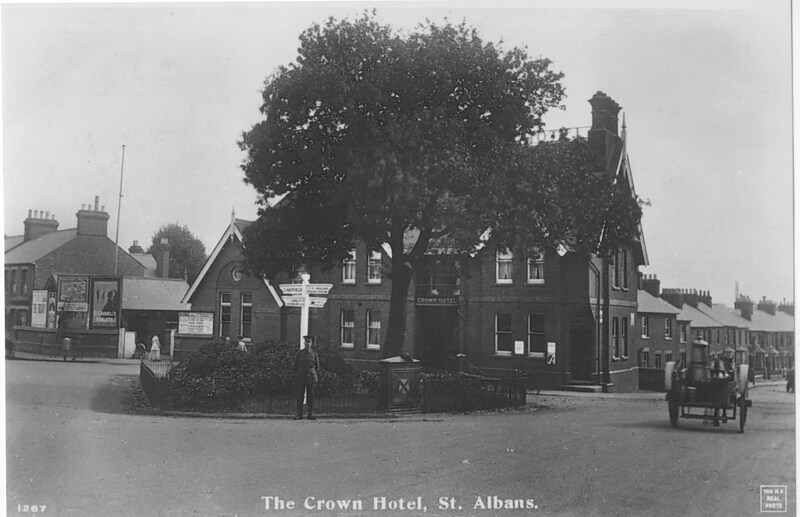 When I came to St Albans it was still there (the low building with roof facing outwards?). There was a clock on the front which had MARTELL (his name) instead of numerals written on it. Although the coal office closed in the 70’s (I think), the clock remained until relatively recently. "Must try and find out more." Do you know more? Please email treeblog@walk-talk.co.uk to share what you know of the tree that used to be outside The Crown pub. The Green Spaces department at St Albans District Council have prepared a delightful and informative leaflet on Clarence Park which, in the words of the leaflet, "contains a wide variety of trees, with many unusual species." The leaflet includes a tree trail, with a map marking and identifying the trees. "The trail has been designed to identify [22 of] the more interesting and unusual trees in the Park." 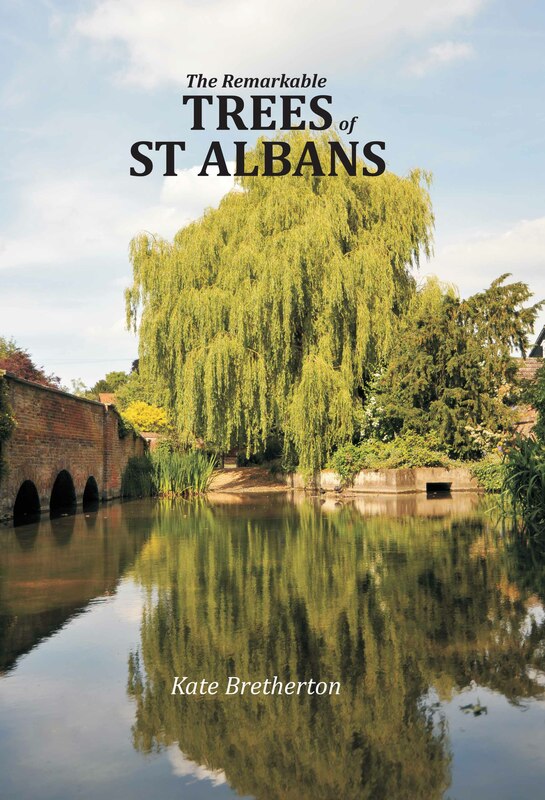 The leaflet can be downloaded in PDF format from http://www.stalbans.gov.uk/leisure-and-culture/parks-and-green-space/parks/Clarence-Park/. "1920-1970 This tree was planted to commemorate the diamond jubilee of their movement by the Girl Guides of Harpenden." Do you think it is the Dawn Redwood? Do you know more? Please email treeblog@walk-talk.co.uk to share what you know of the tree planted to commemorate the Girl Guides' diamond jubilee. In the 1920s "See you at ohly-bowly" was a common commitment between young friends. Ohly-bowly was an old tree on North Common. It was hollow with an arch leading inside. It was easy to climb up the inner walls of the trunk into the branches above and it is up there in the branches that young people congregated of an evening. The tree overlooked the cricket pitch so the scorer sat in ohly-bowly's branches to keep track of the game below. Do you know of the ohly-bowly tree? Was ohly-bowly an oak tree? Please email treeblog@walk-talk.co.uk to share what you know of the ohly-bowly tree in Redbourn North Common. The handkerchief tree in Clarence Park, St Albans. Diana Devereux remembers taking children from Muriel Green Nursery School in Lemsford Road to Clarence Park to see a handkerchief tree's handkerchiefs. Handkerchief trees are also known as dove trees, perhaps from the variety that has soft white down on the underside of its leaves, first found in 1867 in China by Père David, hence the scientific name Davidia involucrata (Mitchell and Coombes 1998). There was no handkerchief tree in Clarence Park on the database of trees with a girth of 70cm or more given to me, Kate Bretherton, by St Albans District Council. David Curry and I went together to take a second (sixth, in my case) and David then went to talk to Andrew Branch, Head of Trees and Woodlands in St Albans District Council and the verdict is that there is no handkerchief tree in Clarence Park now. Does anyone know any more of the handkerchief tree that used to be there? In 2011, someone sent a photograph in to St Albans District Council. The photograph was of a tree in Verulamium Park "near the Roman Wall". The tree was identified as a handkerchief tree and the requester notified but I cannot locate the tree. From Mitchell and Coombes (1998), we know that "the undersides of the leaves of some varieties are not downy but smooth and shiny, but all varieties have dark purple bark crumbling to pale brown, dark green leathery leaves with triangular teeth, tiny purple flower buds, yellow flowers in a round cluster on a dangling stalk between bracts that open yellow and turn white giving the tree its common name of handkerchief tree." It sounds unmissable. Do you know exactly where it is? Please email treeblog@walk-talk.co.uk to share what you know of the handkerchief tree. Anything else to share about trees? 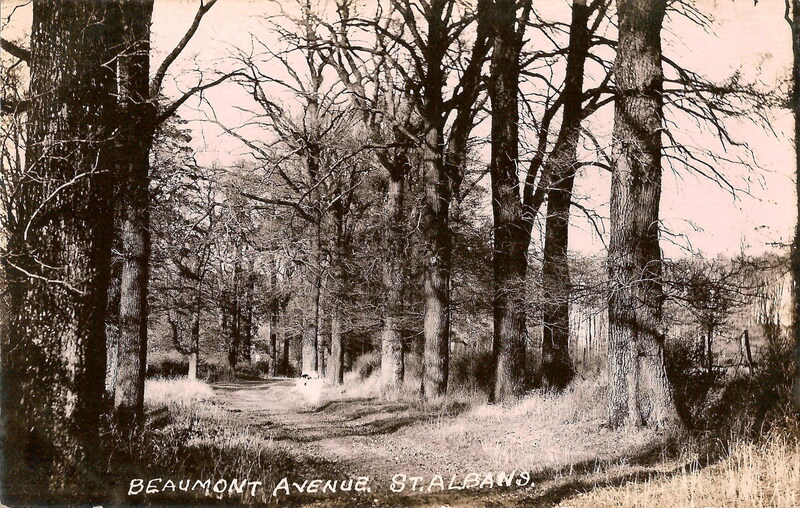 Please email treeblog@walk-talk.co.uk to share what you know of the trees of St Albans District.